Birthday challenges. They’re so trendy these days. I just turned 50 this past March, so what to do for my own challenge… Could I do 50 pitches at Vantage? Yeah whatever. Kill me now. I helped a friend do 40 Sunshine Wall pitches for his challenge and I haven’t been back since. Well, I’ve been back but it took some convincing. That almost broke me. Maybe a skiing B-day challenge. Way better. Jason at Camp 3 at the 6,200′ meadows below the SE Ridge of Fortress. I’ve been eyeing a traverse across the White Mountains/Napeequa area for a while. The cleanest most do-able line I could trace on a map was from White River Falls to Holden. It seemed to offer the greatest amount of approach to adventure ratio that I could see. And most of the skiing would be above treeline. And who could argue about the scenery. 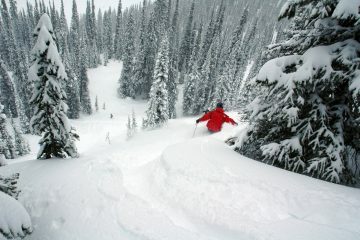 The peak bagging would only be limited by time, energy and weather, and Holden is a cool place to end a ski outing. Hands down. Jason following my boot path to the small heather bench that led us to the safer slopes. We had to cross several large runnels, the largest of which was about two body lengths wide and about 4 feet deep. The hanging cornices above them were anxiety provoking. I floated the idea to my friend Jason Schilling, a recent Wenatchee transplant. Surprisingly he seemed interested, but considering his mountain cred it wasn’t at all surprising. Thankfully he had the flexibility to take days off with short notice. We saw a good window of weather and pulled the trigger on this tour starting 5/11. I have to say this was a brutal tour with more than enough adventure for the average half centenarian. All said and done, Jason’s tracking had us at 44 miles and 19,079 vertical feet by the time we reached Holden four days later. We had mush snow for the majority of the trip. 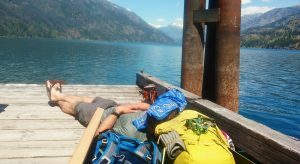 Sloppy, hair triggered snow slides, relentless heat, and heavy packs that only seemed to get heavier the further we went. By the time we dropped the final 3,000′ of (finally!) perfect corn snow off the top of Chiwawa Peak, Jason and I were left in awe by the totality of our time in this amazing range. 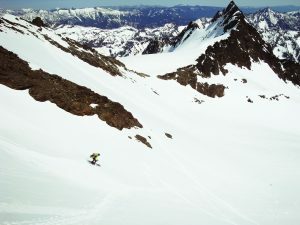 Skiing from Clark’s summit on the South Side back to the Clark Glacier. You can see the notch in the background that we used to access the upper Clark Glacier. It worked out pretty nicely. couloir that provided more direct access to the Clark Glacier than the typical roundabout way over Boulder Pass. Day two we crossed the couloir and ran (slog) up to Clark’s summit. We worked our way down the glacier, foregoing Luahna due to the sloppy unstable snow. We snaked and traversed the Clark Glacier which turned out to be much more complex than we had anticipated. Once off Clark, we skied a forested slope east of Butterfly Butte down to the Napeequa River where we crossed, which I’ve always wanted to do. From there we accessed the North Fork of the Napeequa and worked our way up the mellow slope to Camp 2. 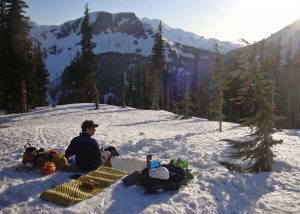 We needed a rest day, a descent without the burden of a crushing load on our backs in the mid-day sun, so we chose Napeequa Peak above where we camped. We probably slept in a little too late, as the snow was mostly mushy but still very fun. On the summit of Chiwawa at last, the final climb of the traverse. We packed and hoisted the pigs onto our backs to get to a hanging meadows on the south side of Fortress. Again what looked straight forward on a map proved to be much more complicated in real life with cornice hazards and cliffs. 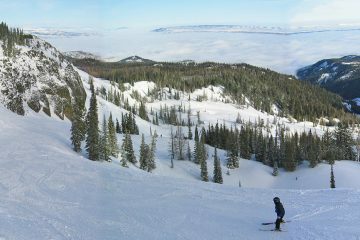 We eventually found an entrance to the slopes East of High Pass which allowed us to traverse North until we could ski fall line towards Helmet Butte and just below Buck Creek Pass. We crossed the creek and headed up to a hanging meadows at 6,200′ on the south side of Fortress for Camp 3. Jason safely arrested and with his ski after being knocked over by the slushy snow, with the rollover not too far below him on the SE Ridge of Fortress. could see from the crest and chose what looked to be the safest slopes considering the heat and mushy snow. Jason dove in first and is almost immediately knocked over by a wet slide. 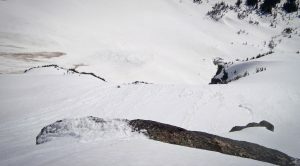 Self arresting is no problem for him, but his ski unfortunately does not have that same skill as it slowly slides towards the cliffs. Jason realizes this highly precarious scenario playing out. This is just not the place to lose a ski and also not the place to get swept over cliffs. 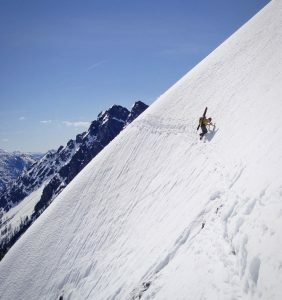 With a monumental effort, sliding with the snow towards the void, he makes a last ditch stab for the ski and somehow snags it. I make a long end run around the cliff bands through several annoying runnels to the safety of continuous snow to Chiwawa Basin. A look at the north side of Clark Mountain. Safe in the flats, we sit in the shade of a pine and reflect on a lot of things and laugh hysterically at the dumbest things that come to our minds. It’s the sort of irrational and hysterical laugh that only the extremely lucky can understand. Jason has a searing pain in his ribs, which plagued him for the rest of the tour. Laughing made him double over in pain. It’s an effort for him to take his pack on and off, even to just stand up. Nevertheless, once he’s on his skis again he motors on and I struggle to keep up. The South side of Chiwawa has been baking all day in this the hottest day of the year thus far. I stopped every few moments to put snow on top of my head under my hat just to keep my brain from boiling over. I follow Jason’s boot pack for the last pitch to the summit. 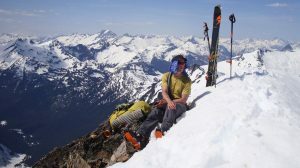 We relax on top of our final high point and look way back at Clark. It seems so distant, both in time and miles. 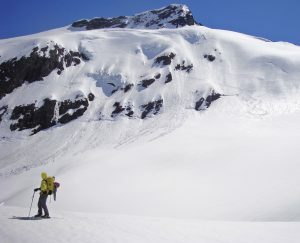 We sign the summit register and ski off the top on the very best and consistent turns we’ve had all tour. We go until our thighs start screaming at us to stop. Rest briefly then go again. I’m thinking, “We earned this. We really did.” Turns forever in one of the coolest locales in WA. We catch our breath then kick and glide over the Lyman Lakes to the outlet. After many dead ends we at last pick up the trail below the lakes, and hike down to an abandoned campground one mile outside of the village, 16 miles on the go.